This 338 Win. Mag. load is the most versatile of all 338 Win. Mag. loads. 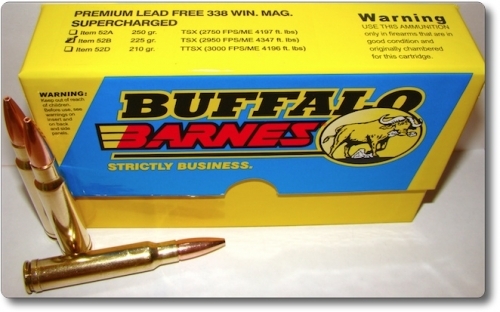 The Barnes 225gr. TSX has no polymer tip to accelerate expansion on impact and therefore opens more slowly than the tipped versions of the TSX bullet. This slower start to expansion causes slightly deeper penetration than the tipped versions allow and this matters when shooting large animals such as moose and bison at bad angles. If I could use only one load for all my 338 hunting, this would be it because of its versatility. This Barnes 225gr. TSX bullet will normally penetrate deeper than 250gr. premium style partition bullets, yet it gives the higher velocity, flatter trajectory and lighter recoil of the 225gr. bullet. For smaller big game animals weighing under 600lbs, you will find our item 52D, (210gr. TTSX) which is tipped and gives more instant expansion, to deliver a more dramatic impact than the TSX bullet. Animals weighing under 600lbs do not need the extra penetration the TSX bullet gives over the TTSX bullet and the TTSX bullet will make larger entrance wounds and do more initial damage. Thanks for making an awesome hunting cartridge. This bull (sunny day) was taken at 315 yards single shot through the front shoulder (quartering towards) both lungs, far rib and stopped, perfectly expanded, inside the hide on the far side. We shoot them through the shoulders so they don’t make it into the river. This one was within 50 yards of deep water and didn't make it more than a few feet.